At the end of my training session in a hot, stuffy gym, I felt unusually dizzy. Right when I got home I ate a meal with carbs and protein, but I still felt “off” so I drank some more water thinking that my 20 oz. of water and my 12 oz. pre-workout fruit smoothie wasn’t enough. After reviewing a few emails, I found myself reading the same lines over and over again, having a hard time concentrating and remembering what I just read. I couldn’t figure out what was wrong so I laid down and tried to take a short nap thinking maybe I didn’t get enough sleep, but I just laid there with my eyes closed and didn’t feel any better. I tested my blood sugar, but it wasn’t low; it was completely normal. I felt progressively worse and needed to figure out what to do so I went over the last 24 hours. The day before I walked 1 ½ miles and completed a 3 ½ mile run in the hot sun, but I felt fine yesterday. I spoke to a friend for advice and she said I was probably sodium deficient so I ate some salted peanuts, had a small coconut yogurt, and sprinkled a little bit of gray Celtic sea salt on my tongue. Within 30 minutes, my energy was back and I felt like my normal self. Some runners take salt tabs before a run. People who say we need to avoid salt are wrong; salt is an essential nutrient. My double-filtered water removes contaminants, but it also removes sodium. 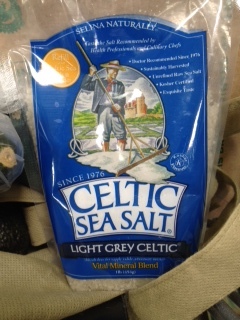 From now on I’m going to have a bit of Celtic sea salt pre and post-workout. It not only makes food delicious (chefs use it in restaurants), but it may prevent me from collapsing after exercise.